All the machines are made of SUS 304 , SUS 316 is also avaliable if required. Finally Package : Plastic bottle, glass bottle, can, jar, , aseptic bags etc. The line is also suitable for processing the fruits that share the similar characteristics. Using efficient belt juice extractor to improve the juice efficiency and the output percentage of pineapple. The production process fully automatic PLC control to save labor and faciliate production management. Low-temperature vacuum evaporation, maximize reserve the flavor substances and nutrients also save energy. 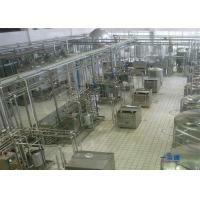 Tubular UHT aterilizer and aseptic filling machine, produce high-quality aseptic juice products. Automatic CIP cleanig . ensure the entire line equipment of food hygiene and safety requirements.